It's been a few months, and pretty much everyone in my family and neighborhood has slowly upgraded to Windows 10. Some have upgraded from Windows 7 and others from Windows 8. For the most part, from a SAF (Spouse Acceptance Factor) it's been a non-issue, which is amazing, frankly. I have been doing a few videos on Windows 10 that you can find at http://hanselman.com/windows10. I'd encourage you to share them with your friend and family or any one who's interested in being more effective with Windows! If you've still got family who are using Windows 8, my tutorials are at http://hanselman.com/windows8 but, hey, it's time to upgrade them to Windows 10. Windows 10 has much higher SAF than Windows 8. The first thing I recommend that everyone do once they've installed Windows 10 is to spend a few minutes customize the default experience. Out of the box you'll get a Start Menu that looks something (basically) like this. This is "fine" but it's nice to customize things and make them your own. 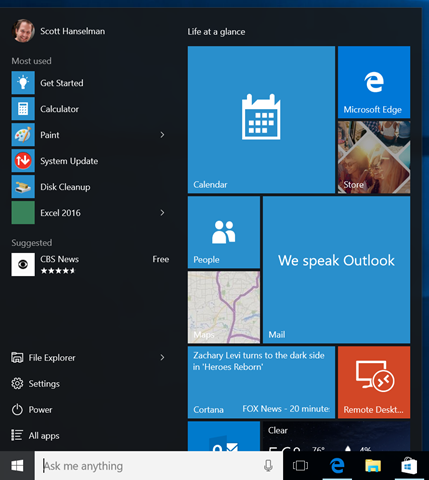 First, you can make the Start menu wider by grabbing the right side of the menu and dragging. Grab the top and do the same thing, and make it the height and width that makes you happy. I like a 2/3s of the screen style "not a start screen but still a big menu" look, myself. Pin a bunch of apps, but not just any app. I prefer apps that I use a lot, but also apps that have a pleasant Live Tile. You can right click on any app and set their tile size. Desktop Apps can be small or medium, and Windows 10 Store Apps can be small, medium, wide, or large. I like to mix it up, but that's what's nice about the Start menu, you can make it your own. In one of my YouTube videos a person asked "how can I make these horrible live tiles ago away." Well, unpin them all. I think you're missing out, Random Internet Commenter. Another solution might be to just turn off Live Tiles. Often it's the movement folks find distracting, not the tiles themselves. Go to the start menu and type "Color." When you go into the Settings app and into Personalization | Color, you can change a bunch of stuff. I like to have the Start Menu automatically pick a color from my wallpaper, then I change my wallpaper every 30 min (more on this soon). When my wallpaper changes, my accent color changes. 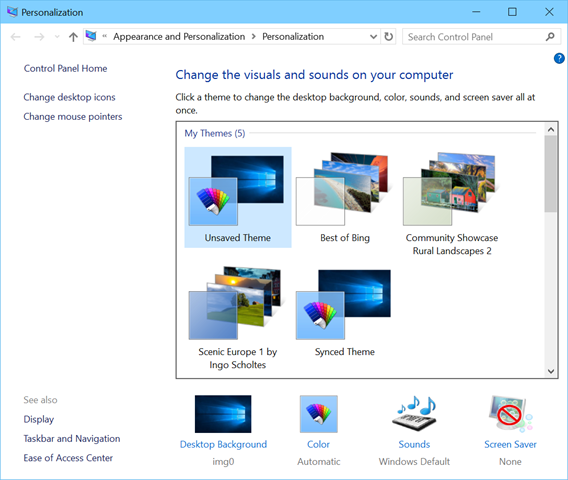 The Themes Control Panel is one of the last places in Windows 10 that hasn't been updated with a new Settings page. That's a bummer because it's one of my favorite features. I hope it lives on. Themes can be downloaded by just searching for "Windows themes" or "Windows 8 themes." I like the "Best of Bing" themes that include wallpaper from popular Bing backgrounds. These themes are really RSS feeds that bring down fantastic free wallpapers. If you combine themes with the "Automatically pick an accent color from my background" feature, you'll get a nice dynamic experience in Windows where your colors and wallpaper change as often as you'd like. I mix it up every 30 min. Another great setting that doesn't get used enough is "choose which folders appear in start." Go ahead and click the Start menu and type "choose which" to get there quickly. Remember also that your Settings menu is full searchable. But once you "choose which folders appear in start" you can have useful shortcuts like these. This is a huge timesaver. Hit Start, then click and you're right in your Downloads folder. 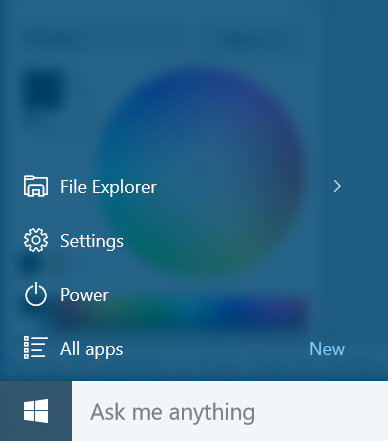 By default Cortana shows up as a text box at the bottom in your Taskbar. But you can change Cortana into a single button and regain more space on your Taskbar. It's up to you. Right click in the Cortana text box and click Cortana. You can select Hidden, Show Cortana Icon, or Show Text Box. You can also remove the Task View button if you want as well. I did a video on how amazing it is to stream a game from your Xbox One to your laptop. It really is. However, I also use Steam and I have a pretty large collection of Steam games. There's a GREAT application for Windows 8/10 called Steam Tile. If you use Steam, go get this application NOW. It's fantastic. It connects to your Steam account and gets your connection. Then it takes the art for each game and lets you Pin that game to your Start Menu. Steam Tile makes for a VERY attractive Start Menu. The games launch into Steam, chained from Steam Tile. Steam Tile is an app that arguably fixes Steam by adding these awesome configurable and croppable live tiles. 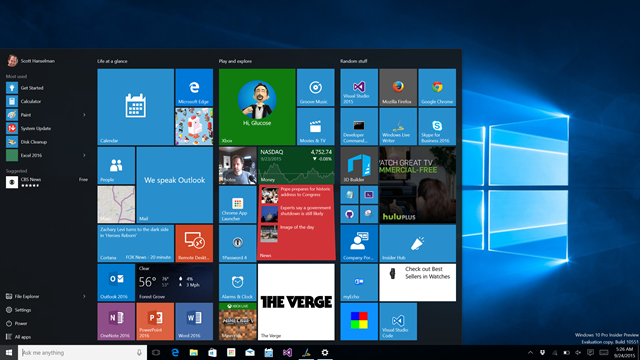 What have you done to customize your Start Menu in Windows 10? Sound off in the comments. Sponsor: Big thanks to the folks at Atalasoft for sponsoring the feed this week! If your project requires image viewing, format freedom, scanning, or other document-centric workflows, Atalasoft’s document imaging experts can help. Evaluate their developer tools for 30 days with remarkable human support. I don't use any UWP apps, so all that's pinned on my Start menu are the applications that I don't have pinned to the Task bar (which are Word, Outlook, Visual Studio, PowerShell, and other frequently used tools), so basically it's a bunch of small tiles for applications like Process Explorer, Sysinternals stuff, hex editor etc. IE is pinned there as well. On the left hand side I enabled all of the folders available except for Homegroup and the Personal folder. The suggestion thing is not there (I'm on a local account anyways). What I really don't like about the All Apps view is that it is squeezed in a narrow list and limited to a A-Z view, instead of taking over the whole of the menu when selected (just like it has been in Windows 8, remember the down arrow?) and offering other view modes (like by category, for example). It's also not possible to create custom folders etc. the right-click functionality is basically missing. This is really a step backwards in functionality and I hope this gets better in the future, for users of Windows 7 this menu is currently a joke when it comes to customization. All in all, I don't really care about this menu because for me it's just a secondary application launcher for everything that is not on the Task bar, and I use the Search functionality for most of the stuff that is not pinned anywhere, although it's a little bit broken because typing "calc" doesn't work anymore (at least for me), I have to write "calc.exe" to launch it. @Florian S. - You may need to rebuild your Windows Search index, I had the same thing happen to me. It's in Control Panel under Indexing, go into Advanced Options and hit Rebuild. One of my favorite bits of customization is to put the taskbar on the left or right side of the screen, vertically. I'm glad the Windows team has seemingly taken the vertical taskbar into account a little better than some of the previous versions, since it would always look slightly wonky on version 7 and under, you could tell the vertical menu was an afterthought. The only problem with making the menu vertical in Windows 10 is that there's no visible search input box, so it's not obvious that you can just start typing to search when the start menu is open. In some of the preview builds, the Cortana search box would kind of extend off the bottom of the main Start flyout when the menu was open (beneath the "All apps" button), but they nixed that at some point before RTM. Usually I want more vertical space (for editing code or reading articles on a website), with plenty of horizontal space to give up on modern 16:9 displays. Rows of text start getting harder to read once they're over a certain width threshold anyway, so why not make the menu vertical? I do the same thing with the dock in OS X.
I appreciate you taking the time to write this up, Scott. I found the option to add my "Personal Folder" to the start menu to be especially helpful. I'm still not loving the tiles, however. I tried pinning Spotify as a tile, since it doesn't handle getting pinned to the task bar very well, but I'd always forget it was there and I'd end up just hitting the Windows key and typing "spo." At the end of the day, I'd be quite happy with an experience where hitting the Windows key just opened up a search box that worked reliably on apps, settings, and documents. Instead of tiles, I'd like to be able to get Cortana's feed in that space - it would be more useful. effected with Windows -> effective with Windows. One start menu problem that I haven't been able to find a solution for is that search stops working periodically. I'll click the start button, start typing, and nothing will happen. It'll stay that way until I reboot - after that it'll work for a while and then stop working again. I haven't been able to nail down if there's any pattern to when it stops working. The feature I'm missing from Windows 7 is the slide out showing the recent files you've been working with. Example: Excel would have an ">" that you could click and there would be a list of the recent files that you could click and it would open that file. You didn't need to search for the file. You could even pin a recent file to the top of all the recent files. This feature seems to be hard to get in Windows 10. I have it for some of my "Most used" Start list, however it's for apps I don't care about. I'd rather have Excel, Word, PowerPoint, PuTTY, etc. But whatever the algorithm is for determining "Most used" doesn't work. 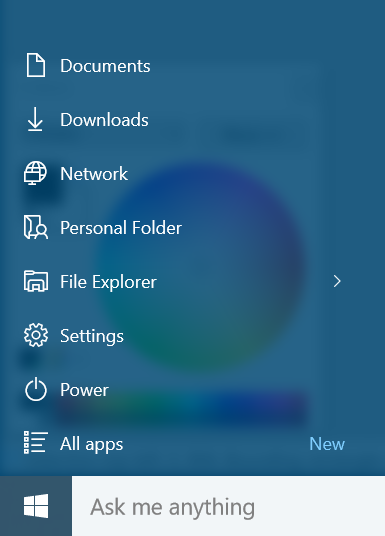 Unless because these apps are pinned in the start menu tiles (right side) then they don't show up as "Most used". As app tile you don't get the recent files list. This by far is the most unproductive feature of Windows 10. I'd rather go back to Windows 7 because I was more productive with Windows knowing what my recent files are for apps I care about. Now with Windows 10 I'm always searching for those files or having to open Excel and then open from the recent files in Excel (2 clicks). This will fix that issue - at least it did for me. Thanks for Steam Tile tip! I had been manually going into the file system like a cave man, finding the .exe and creating a shortcut with appropriate name and icon, but the result was a pretty ugly Tile. The big problem I have with live tiles and the reason I do not use them is that there aren't anything useful. Weather is the only one that makes sense there from the defaults. I use Outlook instead of the mail app - so no calendar, no mail, no contacts in live tiles. Visual Studio could also include something out of the box. Also my experience with the search was similar to Win8 - it is slower and gives less acurate (for my taste at least) results than Classic Start menu and Win7. All that and Cortana not being supported in my country resulted in me switching to Classic Start menu that I had been using on Win8. I really tried loving the new start menu and though I like it much better than the metro home screen, it wasn't enough. I'm wondering if Pictures / Videos added to menu start shouldn't lead to libraries instead of directories inside the personal directory. In my opinion it would be much more useful. @Knagis - I also dislike the Live tiles. Maybe for a consumer they are useful, but for a business they are just a distraction. I didn't see an option to use "classic" mode for the start menu? Where is that? I just removed all live tiles and then basically collapsed the live tile space by hovering over the live tile edge on the right and moving it all the way to the left. @Hanselman - Is there a way to Pin an app under or above the "Most used" in the start bar? So far I seem to only be able to Pin as live tiles which is of no use. It would appear that "Classic Shell" should meet your needs very well. I too, am not a fan of the tiles and other so-called "modern" ways of doing things. I use my laptop to get work done -- not to entertain myself. "Start menu and cortana aren't working." All major controls (like start menu, swiping, windows key etc) were all broken. You would be forced to logoff and then the cycle would continue forever. The ability to do much at all to look into the issue was hobbled. I was able to get around this by rebooting in safe mode and then uninstalling Avast anti virus. I am not sure whether Avast is Windows 10 ready - or whether I was just unlucky. But this issue seems to have effect a number of people. how can I make the "all programs" menu wider. I do not want tiles at all, nor a wider space for tiles. I want the menu itself wider.. I've spent a lot of time with the new win10 start menu and i can't find a premium feature that makes me like it. So id much rather customise the menu by installing Start8 or Start10 from stardock. That Steam Tile functionality looks pretty boss. Way to go, Microsoft, for recognizing one of the best things about PCs! I also just removed all the live tiles and made it just a classic Start Menu. My wife and kids accepted it no problem after that. They didn't even ask a single question coming from Windows 7. How do I get the "best of bing" theme? 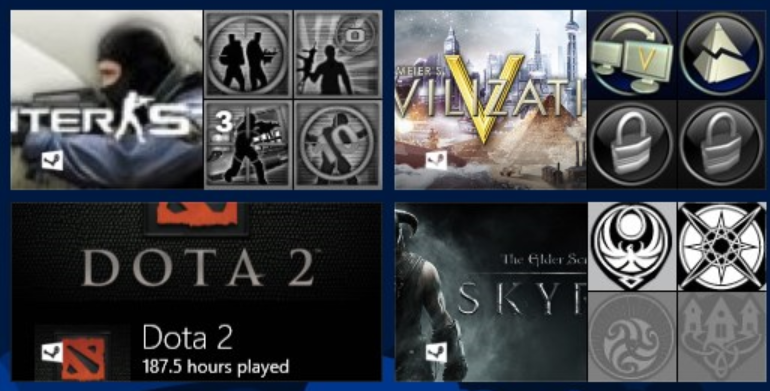 My main problem with Windows 10 is that Steam games lost their icon. So thanks for the Steam Tile tip! I'm going to give that a shot. I won't use it until Microsoft resolves the privacy issues. I was really disappointed they have all the tracking enabled my default. I paid for the software you should not be trying to collect my data in the background. I really like the tiles. Not sure why everyone is so negative on it. Before you wrote this, I took a minute to learn about the start menu and it really works great for me. SAF is very high here, too. Thanks for the Steam tip. Was a much needed customisation - thanks for the tips! What I'm really missing is the ability to immediately start Edge in private browsing. With IE11, I was able to right click the taskbar icon and select private browsing. It's pretty annoying to start in normal mode, go to menu, start private browsing, close "normal" instance, return to private one and finally connect to that OWA website with alternate credentials. I agree with RobertC... I'd really like the ability to make the "All apps" menu area wider and minimize the amount of space allocated to the tiles. 1) can a UWP modify the Action Center as far as adding buttons? Thinking along the lines of controlling lights and stuff at home. 2) can a UWP application listen to another application? Feels like a no due to the sandbox thing, but thinking along the lines of a gamepad to keyboard mapping application. Is there a way to open the pinned websites in chrome, instead of in edge? At what point can we freely downgrade to windows 7 from 8?